A revelation in Les Miserables was Samantha Barks as Éponine; she played the part on the London stage, and she was wonderful in the film. My wife and I were in Oneonta, NY for the holidays, visiting the parents-in-law. They watched the Daughter while The Wife and I went to the local mall to see the movie Les Miserables. I should note that I have never seen the musical, though, in fact, we will later this spring. Missed the 1998 iteration of the film with Liam Neeson and Gerard Depardieu. Not familiar with the songs at all, except one. Didn’t even know the story beyond the fact that some character named Jean Valjean went to jail for a long time for stealing bread. I had read some reviews suggesting that it was wonderful, but others, such as the one by Ken Levine, that indicated that some in the cast, notably Russell Crowe, playing Javert, the official who pursues Valjean, could not sing. It took me a while to figure it out: many of the more critical opinions were based on their notions of the characters based on what they experienced before. The “big deal” about this film is that director Tom Hooper decided that the singing should be done “live” as they are acting. They don’t record it first and then lip synch to the track, as is usually done, where the voices can be “sweetened.” And this movie is almost all singing; the amount of standard dialogue wouldn’t fill a Twitter tweet, someone quipped. Apparently, Javert is generally played by a bass with a richer tone. Still, I thought Crowe was perfectly adequate, consistent with his character’s persona. 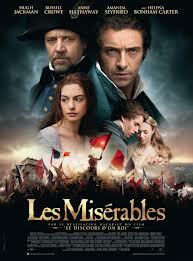 To my surprise, I had a greater difficulty listening to Hugh Jackman, who played Valjean. I know he CAN sing; he’s been on Broadway, and I’ve seen him on the Tonys. Here, though, everything seemed high in his range, and it was exhausting for me to listen to after a while. Give Anne Hathaway her Oscar now. Not only will she be nominated this week for Best Supporting Actress, she will win for playing Fantine. She sings “I Dreamed a Dream,” that song that made Susan Boyle famous, but the passion here was just staggering. Some thought Sacha Baron Cohen and Helena Bonham Carter, as Monsieur and Madame Thénardier were too over-the-top goofy, but I found their first appearance, in particular, a welcome respite from the overwhelming gloominess of the story to that point. Eddie Redmayne as Marius, a would-be suitor to Valjean’s ward, Cosette, was a better actor than singer. Amanda Seyfried as Cosette has a thin voice, though she had a limited amount to sing. However, a revelation was Samantha Barks as Éponine, who secretly loved Marius; she played the part on the London stage, and she was wonderful in the film. Aaron Tveit, as Enjolras, leader of the rebels, was very good, and I enjoyed Daniel Huttlestone as the boy Gavroche. Still, I was moved at the end. At 158 minutes, it WAS too long, but the overarching story, as I understood it, of love, forgiveness, and sacrifice, came through. My mum’s favourite musical. I should see it I guess. Loved this film. This was my first time seeing Les Miserables, however, and I don’t know if I would have felt differently if I had seen the stage production first. I had seen The Phantom on stage before seeing the film and I hated the film. I didn’t find it too long, unlike The Hobbit, which was so painful that I felt like Alex from the scene in “A Clockwork Orange” where he’s strapped down to a chair. As I understand it, the first “Master of the House” scene is very close to the musical but they added some scenes with Cohen later in the film. Loved it. Started crying at “the scene” with the adult Éponine and kept crying for the rest of the film. I’ve seen a theater performance, seen TV’s various representations, listened to the music many times by various singers. even read the book — full length version. They are all so wonderful, but it is the story, as you summarized…love, forgiveness, sacrifice, that gives it all the richness and emotion and gives the songs their depth and reality. My all time favorite. Hope to go to see the movie next week. Roger, the sarcastic reviews were quite funny! I saw an interview with Hugh Jackman who said that, when he was auditioning for the part, the director got right in his face and said, SING. This is where the camera will be. I hate the new studio setups with similarly claustrophobic mics. There is a black screen with a mic behind it to pick up every flaw, every hint of off-key singing – but mostly, having come from a place of freedom to rock on the piano bench and knowing my trusty SM58 (Shure) would pick up the best is where I am most comfortable. Thanks for reviewing the movie. It’s definitely on my “must see” list. Those that have seen it were quite impressed that “Wolverine” could actually sing! I’ve seen the stage play and the Liam Neeson movie. Love it, however it’s presented. Every time I think of Les Mis the first thing that comes to mind is the Seinfeld episode where George can’t get, “Master of the house, keeper of the den,” out of his head. As I know I’ve mentioned, I love this musical, though I haven’t made it to the film yet. I keep thinking we’ll get to the theater, but it hasn’t happened yet. Reading the Levine review, I’m distressed to hear that some songs from the stage production were cut; hope none of my favorites. But I’ve heard only good things about Samantha Barks, which pleases me, because I’m definitely Team Eponine.